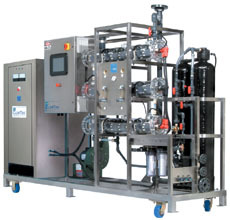 Severn Trent Services, of Fort Wash-ington, Pa., has been designing, manufacturing, installing, operating and servicing ClorTec™ on-site sodium hypo-chlorite generating systems since 1988. This unparalleled experience and a relentless drive for continuous product improvement have led to the new skid-mounted ClorTec system. This new system integrates the proven performance of the company’s on-site generation technology into a pre-packaged design that can be installed and operational in less than one day.